After realizing that his young lemon brother was no longer in the vacant classroom, Cit was now paralyzed in fear. So many confused thoughts and concerns ran through Cit’s wedge and he suddenly got the vibe that the situation was not at all juicy. Returning to the group, Cit burst out in panic. “He’s not there! He’s gone!” yelped Cit. No win a state of alarm, the Fruityz knew it was now time to investigate the matter, and find their best friend Twist Sourz. “Where could he have gone?” questioned Wanda. “What if Cran-Muffin got him!” shrieked Cit. All the fruits were in fear that their Principle had caught Twist and will now be in even more trouble! The Lil Fruityz had so many bad thoughts and uneasy feelings that they decided tore-group by the fruit-ball courts to get to a safe area. While down there they all acted under the idea that Cran-Muffin had busted Twist. They knew their friend now truly needed their help. They all agreed that for the moment they would put all negative thoughts aside and focus on one direct course; find Twist and rescue him! “Okay fruits, we really need a plan here” informed Cit. “Cit is right, we need to get into that school and get our lemon” joined Wanda. The crew was now on it. They sat and strategized until they came up with an unbreakable plan. They called it the Juicy rescue. Before conducting stage one of the juicy rescue, Bizzy went to search for easy ways into the school without being detected. Now that the fruits had to make another journey into the school, they needed to once again tip-toe around the very alert Principle Cran-Muffin. They all figured that he was expecting them too. But they had already put all fears aside and stayed true to the main objective. Scoping out all the possibilities for entry, Bizzy finally realized that after school hours the main doors were open for parents to come in and speak with teachers. “I found a way in here by the front door! Now for Twist, we can explore!” yelled Bizzy. So the fruits all ran to the front doors of Main Squeeze but were disappointed to find that for some reason the main doors were locked. “Oh no the doors are locked, this is such a shame. I guess we’ll just have to go back in the very same way we came” Said Bizzy in despair. Since the doors were locked and the fruits couldn’t locate another way in, they were forced to climb directly back into the window they just escaped from. Making sure the entry way safe to go back through, Cit climbed back up to the open window to make sure Principle Cran-Muffin wasn’t in the detention room waiting to bust them all! Getting assistance from his fruit buddies, Wanda, Bizzy, and Ap’Zal helped push Cit back up to the window where he observed that the coast was clear. “All clear!” said Cit said quickly. They then began, one by one, to help one another up and into their only chance of entering the school and finding Twist. Bizzy of course went last for he is the tallest of the Frutiyz! 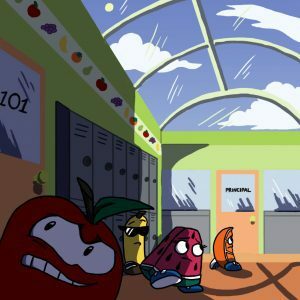 Now altogether, the Fruityz had to secretly squeeze through the halls of Main Squeeze Elementary. Wherever Principle Cran-Muffin was, the Fruityz just hoped they didn’t cross her crumbly path. This would be difficult too because once they reached the main hallway, they suspected that Twist may be in her office. This certainly challenged the fruits but they were unable to leave their fellow Fruity behind so had no choice but to accept the obstacle. As soon as they grabbed Twist, it would be back to the fruit house for some quality juice. 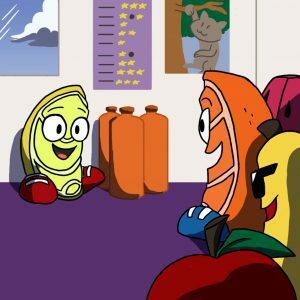 Quietly navigating through the main hallway, the Lil Fruityz had reached Mrs. Plum’s citron room. Mrs. Plum is the physical education teacher at Main Squeeze Elementary and often goes to Citron City for major juicing competitions for juice. All the Fruityz adore this role model yet aren’t trying to run into her either! 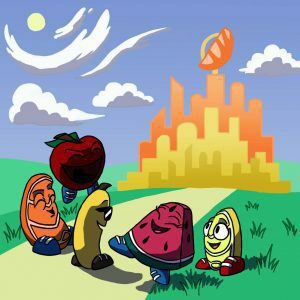 Just a few more classroom’s down from Cran-Muffin’s office, the Fruityz were about to reach their destination. Finally arriving at the door, the Fruityz all lined up in front of a strong door and prepared to push it open and rescue Twist from his office. Whether they would find Twist or Cran-Muffin, the Fruityz had to accept whatever was behind that door. “Were coming Twist!” whispered Wanda. 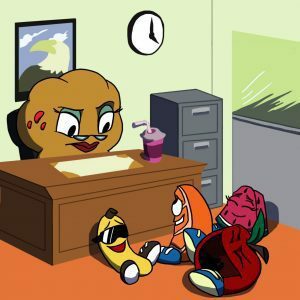 The Fruityz used all the power in their young wedges and push the open the office door only to find Principle Cran-Muffin sitting at her desk with her favorite Passion Fruit juice. The Fruityz froze in fear and Twist was no where in sight. Before they could even speak, Principle Cran-Muffin stood up. “Ah my little fruits, has italready been half a squeeze? It has! Thank you for coming to tell me. Detention is over! You can go get Twist as well, he is in Mrs. Plum’s room cleaning her juice tanks. I grabbed him while he was on the way to the little fruits room!” said Cran-Muffin. The Fruityz just fell back on their wedges in laughter! “What’s so comical” asked Cran-Muffin. “Oh nothing sir!” said Wanda quickly. “It is an inside squeeze sir! You wouldn’t get it.” Supported Cit. Extremely relieved, the fruits headed to Mrs. Plum’s room to retrieve their best buddy Twist! As soon as they entered the room all the Fruityz made a run for the lemon and squeezed him till he juiced! After all the Fruityz reunited, Twist explained to them that when it was his turn to squeeze out the window he had heard Principle Cran-Muffin coming. He then thought quickly to run into the hallway and stall the muffin! When he did this, Cran-Muffin decided that Mrs. Plum needed her juice tank cleaned and she owed her a favor. The young lemon was chosen to clean and Cran-Muffintook him to Plum’s room. It was clear to the Fruityz that Twists’s fast reaction saved the whole group! Twist was a hero. “Let’s get out of here” said Twist. “Good call little bro” replied Cit. But just as the fruits began to leave Main Squeeze Elementary, they ran into Mrs. Plum. “Hello Mrs. Plum” responded the fruits. “Hey Cit would you mind if I talked to you for a second?” asked Mrs. Plum. “Sure Mrs. Plum” said Cit. So as all the Lil Fruityz waited outside Mrs. Plum’s fitness room, they wondered what she could be saying to Cit. They wondered if he was in trouble for something. Although it was just the opposite. When Cit came out of the classroom he had a great big fruity smile across his face. After hearing this rewarding news, the Lil Fruityz instantly broke out into cheers! 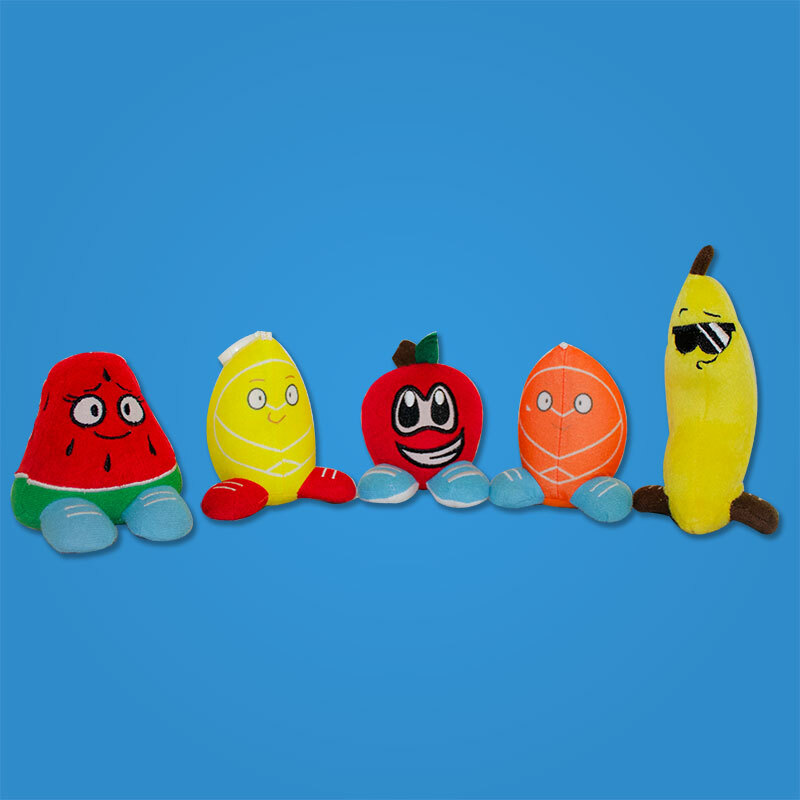 They were so excited for their fellow fruit and knew that he could do well in the competition. And just because Cit is the only Fruityz competing doesn’t mean he’s going alone. With as much support as he can get, this only meant one thing. The Lil Fruityz are all going to Citron City!